File Organizer is advanced feature designed to group and rename files, using their system attributes or meta attributes, before actual recovery. Every file has system attributes like date (Accessed, Created and Modified), file type (defined by extension) and associated with that file type registered application. These attributes can be used to generate new file name or folder (group) for every file with the same attribute. In addition to system attributes some files, mostly media or images may contain meta fields such as artist name, title, album name and others. File Organizer also use these meta fields to group files in a folder with same attribute. Thus, File Organizer operates file organizing rules which defines folder grouping hierarchy and file renaming rules. Drop-down menu in file manipulated views, such as scan results, for easy file grouping and renaming. Specially designed tool view where files can be collected from different sources and organized, renamed or regrouped, before batch recovery to safe location. User-defined (custom) rules once created in any view becomes available in all other views ready to use. Names of files can also be changed (optional) by file organizing rule using file name pattern, applicable for every processing file or by individually applied file name pattern, depending on file type. For more information read File renaming patterns by file type . Important: Changing file names does not affect actual files on disk - its only "virtual" file name changes. For files detected by their signatures Organize Files feature could be very useful for applying meaningful name for every file and grouping them in folders with names generated based on file's meta tags and attributes. To apply file organizing rule simply select it from drop-down Organize Files menu. File organizing rule can be also applied on folder or a group from context menu. File organizing rule can be applied for all files presented in current view or for specific file folder or file group. To apply file organizing rule for all files in a view use toolbar drop-down button Organize Files and to apply rule for a folder or a file group — use context menu command Organize. In addition to predefined organizing rules user can create their own rules, preserved between sessions, by clicking Organize Files > Customize... drop down menu from view's toolbar. Read Create custom file organizing rule for details. File Organizer is utility view that helps to organize files (regroup and/or rename) using their system or meta attributes from different sources (for instance scan and search results) to recover them all at once to selected location. All selected files will be added to File Organizer, excluding duplicates. You can repeat commands above and add files from different sources. In File Organizer view you can remove unwanted files by selecting them and then click Remove button in toolbar or click Clear button in toolbar to remove files from File Organizer view. Use File Organizer feature to group o rename files before recovery. Select Organize Files > Customize command to create and apply custom file organizing rule. Read Create custom file organizing rule for more information. When all files grouped and renamed as desired, select location to recover files and change default options if necessary. Click Recover All button in right bottom corner or click Recover All button in toolbar to recover all files from File Organizer view to one location. Active @ UNDELETE can use custom file organizing rules to group or\and rename files before recovery. Click Organize Files > Customize command in view's toolbar where File Organizer is used. User can decide to leave files as-is (default value) or rename every one of them by using file name pattern (see: File attributes and meta tags) or choose to rename every file by file name pattern associated with file type (see: File renaming patterns by file type ). Select virtual disk boundaries, by default — entire original physical disk is used. Note: Using file meta attributes for grouping or renaming may seriously impact file organizing performance. By applying file organizing rule applicable files can be renamed by using file name pattern specific to each supported File Type. 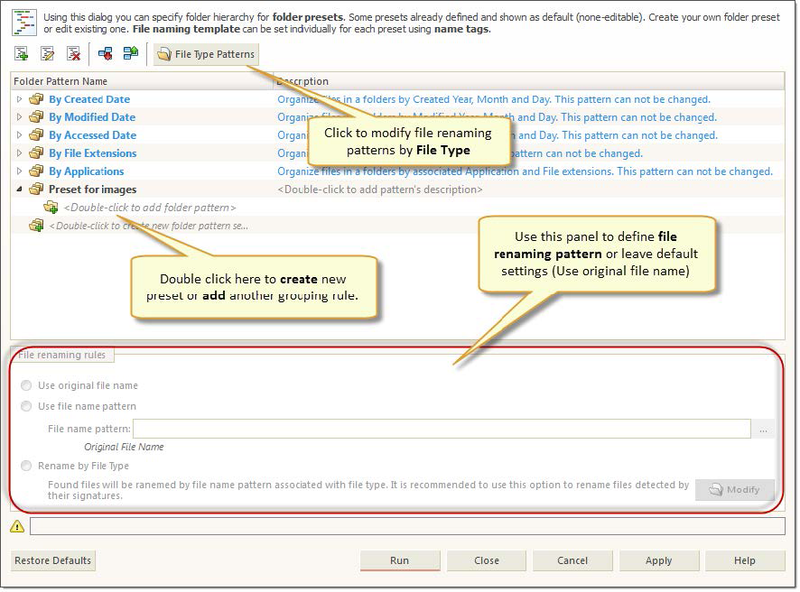 In File Name Patterns dialog user can review and modify these patterns if necessary. To modify file renaming patters for specific file time open File Organizer dialog first. Click Organize Files > Customize command in view's toolbar where File Organizer is used. To open File Name Patterns dialog click File Type Patterns button or in case of Rename by File Type option selected — click Modify button for a same result. In File Name Patterns dialog you can change file name pattern for each file type by double clicking on file name pattern field for desired file type or click Edit button in toolbar for same result. Click Reset button in toolbar to reset file name pattern for selected file type to defaults or click Restore Defaults to reset all file name patterns to their default values. 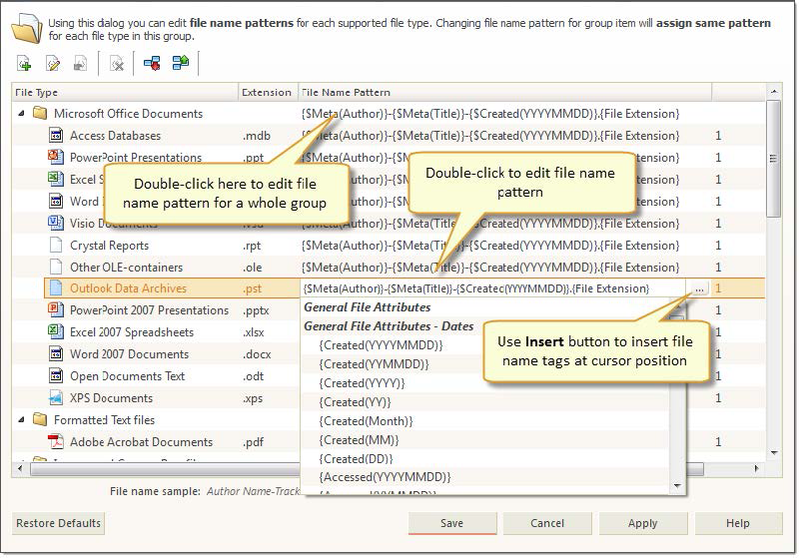 You can edit file name patterns for every file in a group at once by editing group pattern. User can add custom file type pattern to existing list by clicking Add button in dialogs toolbar and completed required fields: file type (either type it in or select from drop down list) and providing file name pattern using Insert button to insert file name tags at current cursor position. Click Apply to preserve intermediate changes or click Save button to save and close dialog. File organizing rule uses pattern tags that represents single (or several) values retrieved as file or meta attribute from file. Note: Each date attribute can be additionally structured with attributes: Month, Day, Weekday. Note: Date Taken (YYYY) can be additionally structured with attributes: Date Taken (Month), Date Taken (DD), Date Taken (DD - Weekday). Note: Each date attribute can be additionally structured with attribute: Date Month-Day.